The Bureau of Labor Statistics in USA has noted that in March 2015 there were around 5.1 million jobs openings and the number of people who were laid off was around 1.8 million. Being terminated can occur due to a number of reasons for which you might or might not be responsible. However if you are terminated it would be tricky situation, when you are asked regarding the factors why it did occur. Whether you accept it or not, this simple incident plays a major role when you start getting ready for your next job interviews. Below we have outlined the various strategies which you can use when you are asked about your termination, in an interview. How to Handle “Getting Fired” in an Interview? You might be unemployed right now but you can create a good impression. Here you can show your potential employer that you are using this break positively by engaging yourself in undertaking a free lancing project or using the time to learn some new skills. When you mention that you are undertaking these above activities, your potential employer would view your situation in a positive manner which is very beneficial for you. Do not fear of any unnecessary preconceptions that a prospective employer might have regarding why you were terminated. The best way to handle this situation is to write down the various questions that you might be asked in an interview and practice your answers well for them. It would be a good idea to have a few mock interviews with a close friend. This practice would make you confident and squash off your unnecessary preconceptions too. It’s been a few weeks from the time you have your job terminated. However have you analyzed the genuine conditions realistically regarding why your last company terminated you from your job? It is essential that you analyze the conditions and recognize bare facts. The factors could be many like, absence of a specific skill, average performance or even dirty office politics. The process to self examining the causes would be painful, but once you undertake it correctly, you would understand the condition and be more prepared to answer the question in a better fashion. If you were terminated due to other reasons and not your job performance, you really have no say over the matter. You have no control over the circumstances even if they make you mad and angry. Remember when you brew negative energy within you, you are burning up your energy. Your attitude might also appear negative in front of a prospective employer. Thus accept the prevalent conditions and be truthful. 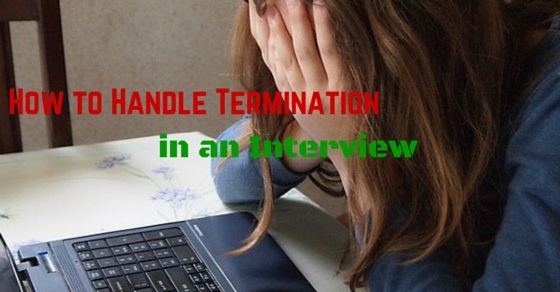 In most cases the person interviewing you is aware regarding why you have been terminated. He is just checking if you have the right skill for the job and whether you can handle stress well. One of the best strategies to implement if you have been terminated in your last job would be to speak to the interviewer regarding your job termination, in case you are not asked about it. This would create an impression that you have quick response time and have learnt from your mistakes. Speaking the truth in an organized manner would create the impression that is essential and this would also help you get the job for which you are being interviewed immediately. Here if you can add a few good references from your last employers and back it with good industry knowledge, you would be a sure winner in your job interview. When taking an interview after you have been terminated, it is essential that you highlight the skills you have which would make you the best candidate for the job. During an interview you should never use the word fired. Instead use words like termination, which makes the incident more acceptable. Never highlight your personal shortcomings that you have or indicate that you are a victim of office politics. This would indicate that you are more of a loner in office and are often victimized. For example if you have been terminated because you could not learn computer programming and are not technology savvy. You can tactfully mention that and later on highlight the fact that you are good at solving client and customer problems quickly. Most companies are restructuring and downsizing people in order to accommodate their shrinking company budget. If you have been a product specialist before, you can speak to a prospective employer regarding your other skills like marketing and handling customer queries tactfully. Remember in a slow economy the more skills you have, you have better chances to get your next job which could be multi-dimensional in nature. If you are asked in detail regarding the conditions which lead to your termination. It would be best to keep your cool when you are explaining the situation. Most people understand that it is a painful process, but you have to do this as it is an important part of your work life. Accepting it would help you to get the best job available quickly. When you are questioned regarding whether you had minor differences with your boss, it would be wise to accept the truth. In most cases the company has done research on you and you should speak out the truth here. You can explain that you had a few minor issues with your boss and had differences of opinions on important things. Further you can explain that you have analyzed the mistakes that you have made earlier and learnt from the situation. This answer would create an impression that you analyze your work and try to better yourself and thus this would make you stand good in the eyes of the interviewer. You must understand that you have to be a survivor in this bad corporate jungle world. Thus understand, explore and analyze the conditions which lead to your last job termination. Remember you have to forgive yourself for the embarrassment which you suffered, when your job got terminated and positively move towards the next phase of your career life. If you are unable to do so, then it would be difficult for you to get your next job easily. Thus take it up as a challenge, plan out your strategy in detail regarding how you can overcome it.